The textbook has 7 chapters based on topics relevant for the 6th grade such as animals, fairytales, diaries, transport, film history, the planet, and USA and differences between American and British English. The book starts with a useful spread presenting the different elements of the chapters and helping the students to navigate through the pages. The role of a funny character, Mr. X. Plore, is also presented. He gives tips, shows strategies for better reading, writing and talking and shows how model texts can be used. Every chapter starts with clear learning aims and ends with self-evaluation tasks so that the students can control their learning outcomes. increased emphasis on grammar and vocabulary. Writing English texts is taken more seriously compared to many similar materials. The book gives a good understanding of differences in global English. The layout is student friendly, and offers great variation from spread to spread. There is also a great variation in photos and in the use of humorous illustrations. Different ethnic backgrounds are represented on photos and in texts. Songs and raps are integrated, and support the variation and motivation. There are many differentiated exercises both in the textbook and the workbook. The teacher's book is rich with explanations, background information on the content, activities meant for Smart Board etc. Very explicit coverage of the rationale, and the competences to be developed by the materials as well as a comprehensive collection of materials. There is a lesson plan, proposals for the single chapters, jokes and links to digital resources and smartboard matters. 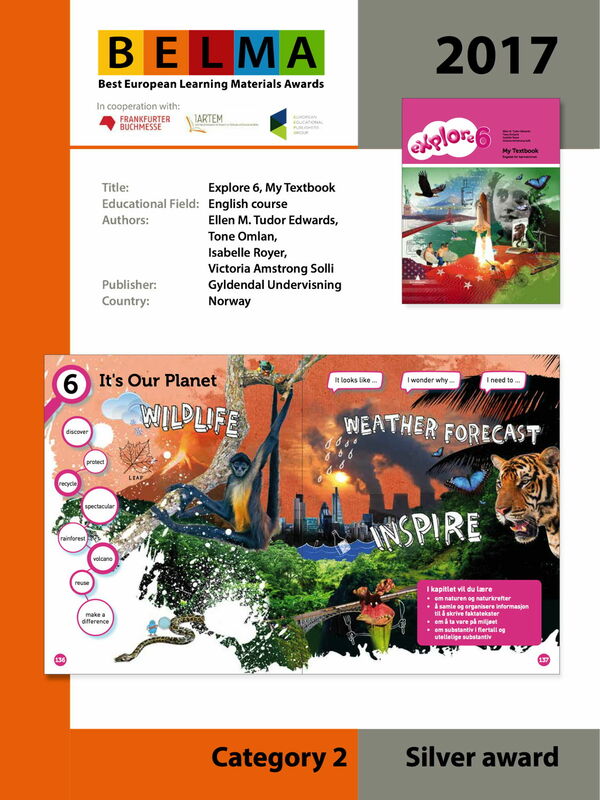 In each case they are clearly arranged around an image of the corresponding textbook double-page spread (teachers 'guide). A very broad range of topics from cinema to environmental protection, not just the usual ones, bringing into play a wide range of different text types from different settings. A visually attractive workbook (in colour) with a wide variety of exercises. The web site provides well worked out suggestions for the teacher. The lay-out is easy on the eye as the pages are not crowded. The choice of humorous illustrations is highly appropriate for the target group, including funny cartoon characters. New vocabulary items are usefully displayed in the bottom corner of all pages. 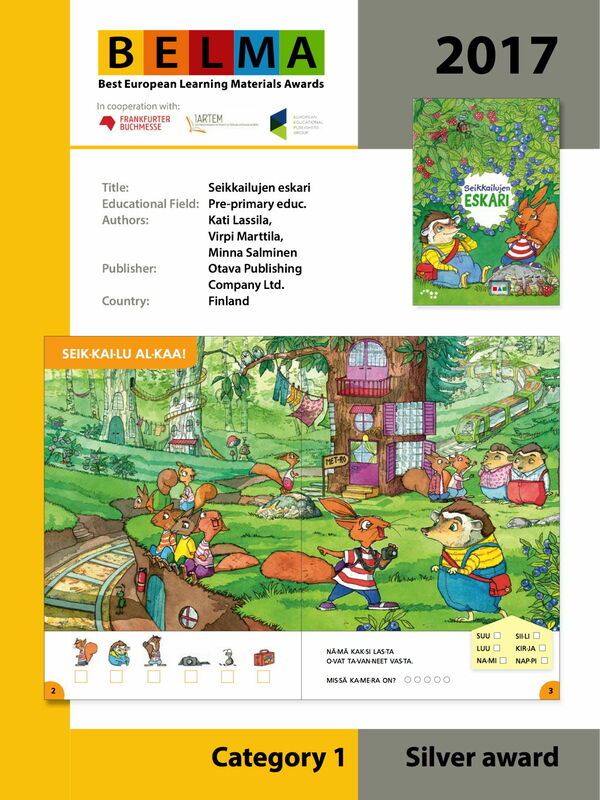 Publisher : Otava Publishing Company Ltd. The book is practically organized for young learners and for their teachers as one part is about literacy and the other part about numeracy. It is also good to present literacy and numeracy as parallel skills. The book has funny illustrations of small animals that most of the children will know from their home environment. The animals are different in size, clothes and attitudes, just as children are. The characters are seen in the preschool environment and at home and are involved in activities connected not only to literacy and numeracy but also to environmental education and to the promotion of social skills. The activities are recognizable for most children. There are also illustrations of children showing differences in ethnical background. The content seems to have a clear progression going from mostly drawing and colouring to learning letters, forms and numbers. There are also exercises for children who can read. Many of the math exercises are problem solving and give a good basis for further math education. The booklet is a training book that can be used outside preschool and has many exercises connected to letters and forms, but also colouring and drawing. There is a rich internet-based teacher's guide where every spread is displayed and commented on, along with songs and additional material. The overall design of the learner's manual is straightforward and relevant as well as age-appropriate. The activities and tasks of the Learner s' book and workbook are suitably labelled enabling the learners to easily carry them out in the two books. Humour is nicely integrated via a collection of funny illustrations of small animals throughout the books. The material not only deals with literacy and numeracy but also usefully include concern for environmental and social issues. Intercultural consciousness is seriously taken into account as some illustrations involve young children of different cultures and countries. The reversible workbook is funny and inspiring and invites the child to enter one of the two worlds of life either the world of stories (fiction and experiences) or the world of mathematics (interestingly the world of mathematics is 6 pages bigger/longer than the world of stories). But in the pupils book it is the other way around: stories have 65 pages, math 31 pages. Funny drawings in the material clearly invites learners to take part into discussions. Attractive, colourful and age appropriate set of workbooks that introduces basic of geometry to young children in a playful and interactive way. As the title of the set indicates, the set aims to make learning fun - and it succeeds. There are many different activities inviting children to draw, connect, colour, cut, match shapes, puzzles... that suit a variety of learning styles and approaches. The overall format, design and layout are clean, simple and modern, not too crowded and with high production standards. These are very relevant materials for the development of children's figurative thinking and motor skills. The tasks are easy at the beginning but get more complicated step by step through the whole study set. The names of geometric shapes are successfully introduced to children. It is good idea to give examples that young children have to follow. There are some tasks for pair work (p 39 Oblitsa) and for the development of creativity (p 9 Slagalitse). The material fills an important gap by preparing preschool children not only for the use of numbers but also for geometry. Transferability is one of the strongest features of this material as it does more than prepare children for geometry: spatial awareness is an important life skill, just as playing with lines helps to develop graphomotorics skills for writing. Other than spatial awareness, it also helps to develop perception and observation skills. A good variety of exercises keeps the material interesting. There is a very good progression from simple to more complex tasks, exercises gradually building on each other. Publisher : Texto Editores, Lda. Est. Complete and seamless integration of a wealth of materials and media with totally easy access to all of them. Works on and scales to all platforms. A rich source of local and international music through the centuries with a clear focus on the contemporary - as befits the target group. Excellent and unbiased background information on all artists featured. Intercultural and cross cultural throughout, bridging the gap from Carl Orff to Adele. Full of lovely ideas like the Loto Sonoro which starts each chapter and the pop-up orchestra for the classroom. Great encouragement for students to pick up an instrument - including karaoke versions of each song. The whole course is geared to active students' involvement and brings music to everybody even if the student's background is not at all a musical one. This music course applies an interesting concept, i.e. a very pragmatic action-oriented learning by doing approach focused on listening, playing and composing music activities. The course package is very impressive with a whole range of different and complementary materials enabling the teacher to easily cater for differentiated activities according to the learners' needs and levels. The learner's manual is well structured and easy to work with, thanks to a systematic and useful signposting of the theme, topic, skill and type of activities dealt with, in the page header. The teachers´ resource pack file is remarkably comprehensive with numerous supplementary printed and digital materials, aimed at planning the course, reinforcing the learners' motivation or evaluating the students' achievements. The teacher's manual is efficiently designed, with a footnote on each page displaying which printed or digital resources are available for the unit presentation as well as the connected learning activities. The material offers the learners a really large variety of exercises, practical tasks, games or tests which will motivate wide-ranging audiences to enjoy music. The different activities and exercises use an extensive selection of musical genres enabling the teacher to introduce and expose his/her learners' tastes to all sorts of music. The unbiased treatment of traditional folk, pop, classical and non-Western music simply as different expressions of music is laudable; the same is true of the different abilities needed to appreciate music, from listening, understanding and learning about music to making music. The teacher´s guide contains extremely detailed material with descriptions right down to the single lesson and single (multiple choice) tests. The integration of the learning of Orff instruments and recorder into the school music education system is an excellent idea, providing chances specifically to children from disadvantaged families. Comprehensive audio material on the CDs. Publisher : Koolibri Publishers Ltd. 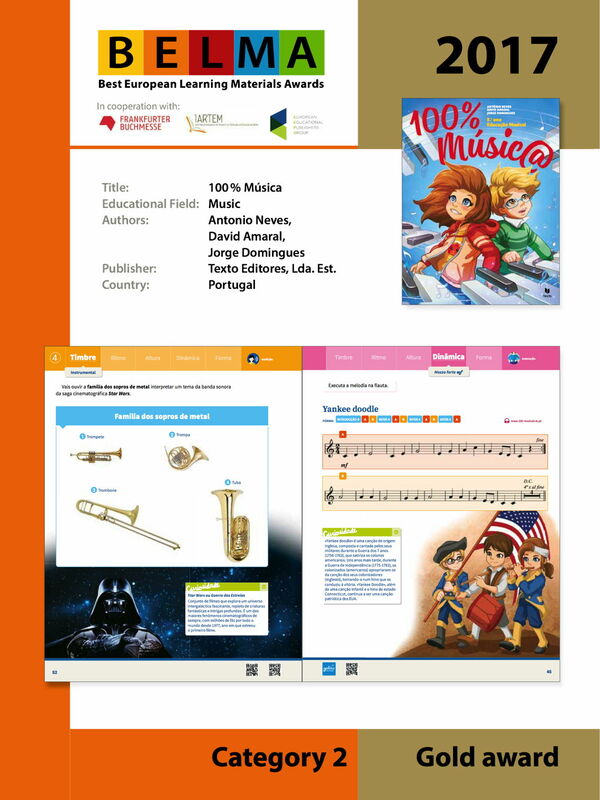 The textbook starts with a variety of songs with texts and music notes and with a special explanation of some notes and musical expressions. It continues with a presentation of a classical orchestra with all musicians, instruments and the role of the conductor. The two parts are varied, and seem to have a clear progression. The content does not seem too hard for 5th grade students, but seems to take them seriously as learners. Both young and female conductors are presented. Another positive feature is the presentation of famous musicians and other artists with disabilities, such as Steve Wonder, Andrea Bocelli, Evelyn Glennie, Meelis Luks and Nobuyuki Tsujii. humorous way. The illustrations make the background of the persons ethnically neutral. The layout is clear; the pages are clean and not too full. Important musical terms are highlighted in an effective but discrete blue colour font. Some songs have a special background on the spread (see e.g. 8 - 9, 16 - 17) giving a special atmosphere to the song. The workbook has a good variation of exercises. It has a clear layout but without any colours. Different approaches to learning music are integrated: students are invited to play on different instruments, to sing songs, to fill in tasks in the workbook, to listen to music from the textbook CD. The course is made interesting for students through the variety of the tasks and in the selection of songs, by creative tasks, cartoons, and depiction of the episodes from the lives of famous musicians. Theoretical part is rather demanding in content. Music is related to art, literature (p 39: you will live longer than your relatives), human health (p 37: laughter therapy), history. National identity is supported by using Estonian poems and songs. Using Estonian cymbals by famous musicians is mentioned in the textbook as well. In the workbook, a song about sportsmen is used to list the names of Estonian sportsmen (p 24). 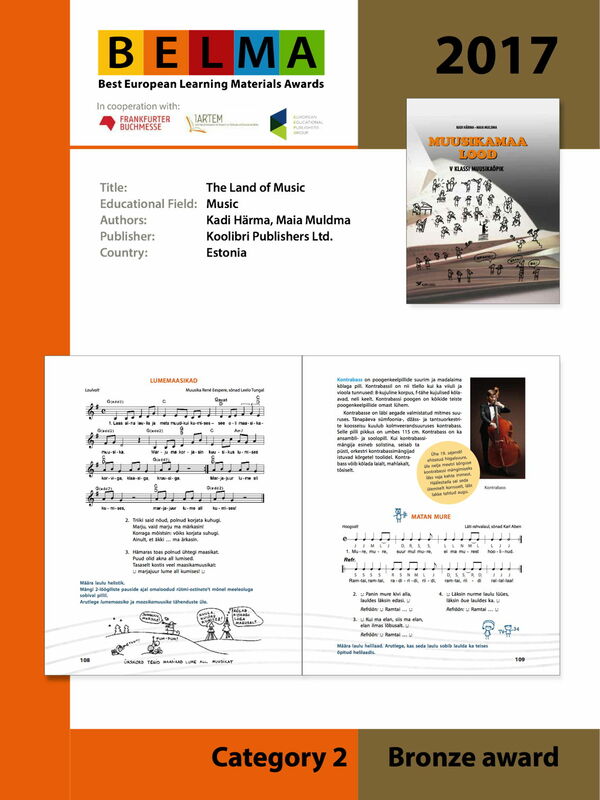 White Russian folksongs (p 10 - 11), Finnish folk tune (p 17) contribute to international education. Cartoons are entertaining and often have educational value. There is wide variety of tasks in the workbook: simple and demanding ones, tasks for individual and group work, tasks on singing, solving crosswords (p 23) , filling in different blanks (p 19), writing a song (p 17). Sets music in the context of the wider artistic environment. Encourages sympathy for people with specific difficulties or even unusual talents. Provides material for both individual and group work. The design and presentation of the pupils' book is attractive and easy on the eye with an intelligent use of colour throughout. The workbook is clearly set out and provides plenty of space for both the artwork and the answers to the questions. This is a very rich set of learning and teaching materials - about 30 units. They all facilitate children's learning and makes teachers' work easier. The digital textbooks include important additions to the printed books. There are possibilities for listening to music and texts read aloud, to solve tests, and to see videos. The students' books are very child-centered. Value education is well covered in the study set. Children are occupied in learning and playing, families contain elderly people and a lot of children. There is also a black girl and a boy in a wheel chair (Okolen svjat). The overall design of all the materials is very attractive and age appropriate. The use of strong primary colours and humour in child friendly illustrations used consistently across the whole set helps to motivate children. Individual books and workbooks are suitably slim, and the page layout (apart from Maths textbook) with large illustrations and large fonts is very appropriate for this age category. In addition to developing cognitive skills, the set provides ample examples for developing social and emotional skills. Respect for others, friendly and polite manners, and intergenerational relationships are consistently promoted in the whole set. The visuals include illustrations of children and adults with disabilities depicted in various real life situations and in interactions with other children. This is very laudable. The differentiated approach allows greater flexibility and adaptability to various contexts and diversity of learning styles and the needs of young learners. Using the same characters and design throughout the material provides a sense of continuity for the students. The animations illustrating how to form a letter or number in the online resources can be especially helpful to children with visual learning styles. The introduction of spatial awareness exercises in the mathematics material prepares the students early on for more complex concepts. The textbooks are accompanied by a detailed teacher's guide with differentiation opportunities and ideas for individual and group work. Publisher : Rokus Klett Publishing House Ltd. This is a very comprehensive set of materials for all the aspects of language competence. Learning aims are clearly stated in the student's and teacher's book. Different learning activities are successfully incorporated. There are flexible and interesting tasks presented throughout the learning process. Group work has an important role to play in the study set. Useful hints for lessons are given in teacher's book; for example, possibilities for motivation, differentiation, etc. For some teachers, the answers to tasks in study set may be helpful. Teachers' CD includes useful worklists, tests, etc. A very attractive, modern looking set of materials displaying high production standards. A dynamic design and layout make the set interesting and engaging for this age group. The books and units' structures, visual symbols and learning objectives are very clearly explained at the beginning of the student's book. One of the strong features of the set is its focus on developing social skills and intercultural awareness. There is a good gender balance and it's good to see that people of all ages are presented in everyday interactions. All this helps develop pupils' positive social and emotional skills. The student's workbook is also very well designed, with full colour print. The set provides great variety of activities, tasks, exercises, and puzzles, crosswords etc. that are age appropriate. Pair work and group discussions, work with modern media which are an integral part of the learning process and are effectively used to develop pupil's listening, writing and speaking skills. The set's strong methodological approach is in pair with high production quality. The situation-based, communicative approach with realistic characters using contemporary media and means of communication makes the material very engaging for students (write a rap song, make a short video, write an email, a blog entry etc.). 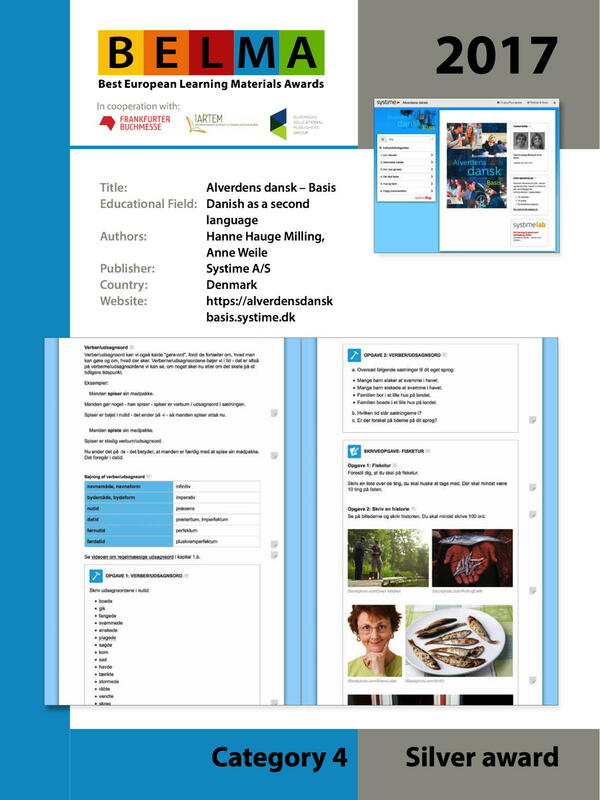 The material is very well designed both methodologically (individual, pair and group exercises, role-play, interesting project tasks, clearly stated learning goals, self-evaluation pages) and visually (high quality photos, navigation made easy with colours and symbols, clear page layout). The exam preparation section simulates a language exam that helps to prepare students for the kind of exercises they will encounter there. The teacher's guide is really useful, clearly stating learning goals, offering teaching guidelines, differentiation opportunities, tips, variations on exercises and worksheets and tests on the CD. 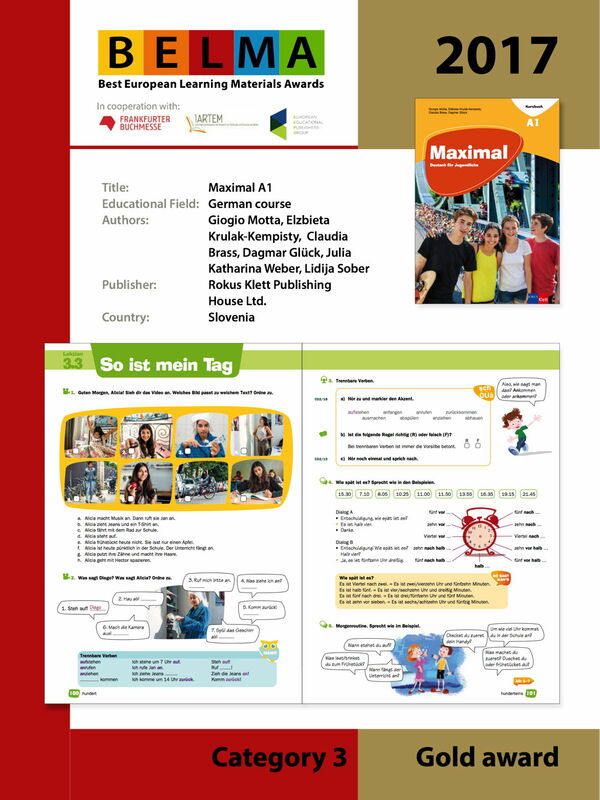 The material introduces the cultural elements of German-speaking countries and at the same time illustrates diversity with students of different backgrounds (Asian, Turkish, Middle-Eastern etc.). The concept of the textbook is original as the authors have selected 25 topics to reflect the historical knowledge the students should have, according to the curriculum. The 25 topics are presented in 25 chapters closely related to learning outcomes in the curriculum. The overall idea is that the students should not only read about history, but be active and work with history. Every chapter starts with a motivating activity to engage the students and a presentation of concrete persons, events and/or situations, which lead the students into a deeper and broader historical context. The selection of topics seems relevant and appropriate; both international and national events are taken as points of departure. This solution may engage students in a better way than a superficial presentation of 'everything'. The book starts with a relevant chapter to introduce the students to historical methods and the study of resources. After each sub-section in the 25 chapters, topics for reflection and discussion are presented. There is a wide range of exercises at different degrees of complexity both for finding out historical facts, and for further work.At the end of each chapter, a useful list of further reading resources is presented. 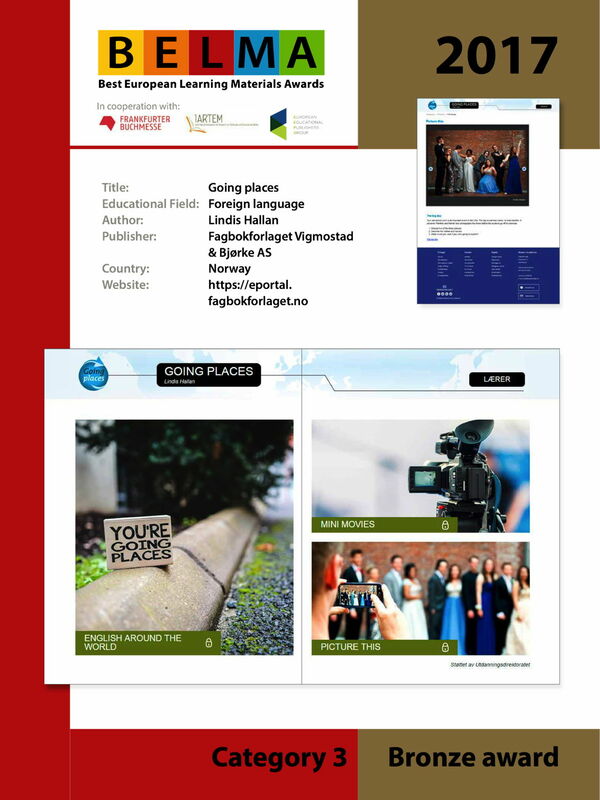 The resources are international, representing different cultures and continents (e.g. Amin Maalouf, Mark Kurlansky, Bernal Díaz de Castillo). This is motivating for students with different cultural backgrounds. The chapters also provide interesting excerpts from important international and national documents. The lay-out is clean and clear and the paper of high quality with attractive and well-chosen photos illustrating art and historical monuments. A really comprehensive teacher's book offers maps as well as extra material such as newspaper articles and games and many references to relevant internet sites. Beautifully laid-out and crafted textbook. Norway, Europe or the world to reflect a specific period in time (sometimes more than one). These topics are contextualized at the beginning ("When and where?") and at the end (e.g. methods used) and include Athens as the first democracy, the iron curtain, the Nordic welfare system, and the Indian struggle against colonization. Sensible medium sized texts of no more than one page. Connections to the present time whenever possible. Leading questions in the text, summarizing exercise questions and more complex tasks at the end. Teacher´s guide with "keys" (and further information) for exercises and tasks as well as carefully selected additional tasks (to photocopy), often with resources. There is additional material, particularly maps, in the teacher´s guide. The use of historical figures and events helps focus the reader's interest and introduces a sense of perspective. The relatively short chapters will ensure the reader's attention is held throughout. The source material is clearly distinguished from the text through the use of yellow tinting. There are opportunities for differentiation provided. The whole teaching approach encourages and develops critical thinking. The teachers' guide is comprehensive and offers a great deal of help for both experienced and inexperienced teachers. The production values are high with a simple yet effective layout and very good quality printing and binding. The course includes 11 English-speaking areas around the world, and therefore avoids a concentration on Britain, which is common in much material for English learners. It is rich material where the students are offered high quality photos, texts about a wide range of topics, films where young people from Britain and USA with different kinds of English tell about their life, vocabulary learning, reading, listening, writing and speaking exercises. The students can also test themselves through quizzes. They can record themselves in the speaking exercises, and they can save their own written texts; these opportunities make it possible to control their speaking and writing skills. All texts are read aloud to the students. Many of the exercises are meant to be done in pairs. The texts are in two versions, one more complicated than the other, and provide for differentiation. The topics offer knowledge about young people in many parts of the world, and also about geography, history, and culture in a way that is suitable for the age group. Many of the topics provide good opportunities for discussions in the classroom. A positive feature is that first nation people have a prominent place in the material. English is used as the instruction language. A rich teacher's guide can be downloaded as a pdf. It is easy to navigate through the different modules of the course. The digital resource is clearly structured, easy to open and navigate. Each of the 3 main areas has a similar structure which helps students to work with the resource both in school and independently. An interdisciplinary aspect is one of its strong features, as learning English is combined with geography, history, art, etc. The resource successfully develops social and emotional skills as it invites students to discuss, debate and explain various perspectives. Tasks and activities include role-play, pair work, and group discussions. There is great variety of topics - presented in videos, audio recordings and pictures. In the Mini movies section, difficulty level is clearly indicated on the front page. Students are provided with an immediate feedback as they work with the resources since all tasks include assessment of progress and check correct answers. Very inspiring choice of movies and pictures which present the English speaking countries. The cultural areas in the widest sense of the words are well chosen and very well presented in various inspiring ways. Various types of tasks and exercises are offered. Strong introduction with a clear presentation of rationale, aims, structure, etc. A short introduction to contemporary literature (in English) and - at the beginning of each chapter - a short introduction to the chapter-building aspects of modern society (in Danish) - this is a very sensible use of different languages. In every top-level chapter (ranging from identity to risk society) there is well-guided text work on excerpts from relevant current English-language literature, but also interpretative work regarding e.g. , non-fiction texts (e.g. by Barack Obama - rhetoric ), images or films (e.g. "Babel"). Because small ´hyper 'text/media snippets are avoided in favour of scrollable units, the navigation is very clear. 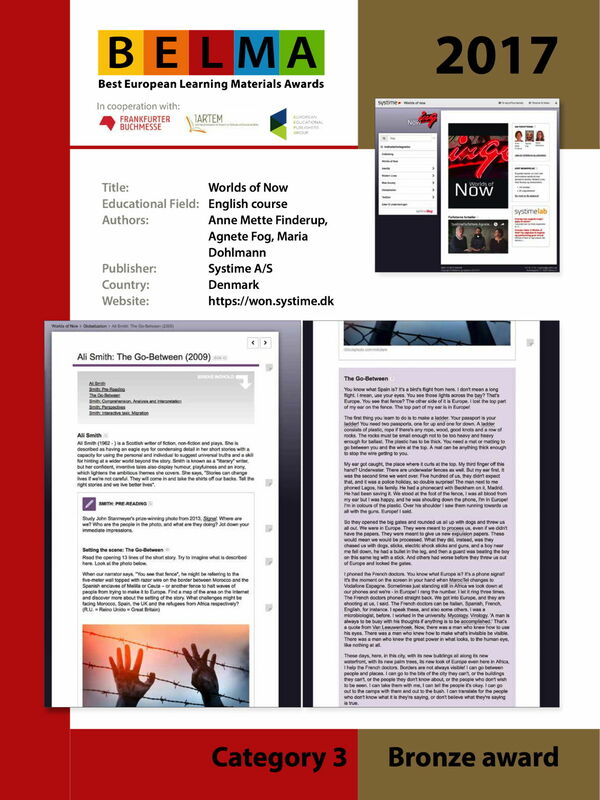 Toolbox with text about analysing different types of media, talking (in the form of a quiz) and in particular writing (different text types) mainly about texts. Really dynamic and eye-catching opening page to catch the attention of the learner. Dramatic use of photographs and evidence of a wide range of reading/reference material. Many opportunities for testing understanding with very clear and helpful guidelines. Challenging and wide-ranging collection of modern texts which expand the readers' horizons. Readers are introduced to topical concepts through reading from selected texts. The topics proposed and described with texts from numerous contemporary writers are highly relevant and appealing to the target group. The students have the opportunity to express their experience, their problems and answer the questions by clicking the writing tool which lets the teacher follow each learner all the time. Totally integrated media with easy access from all entry points. Sleek, attractive, brilliant use of media. Very intuitive navigation with multiple access points. Introduction videos are engaging and fun, language very student centered. 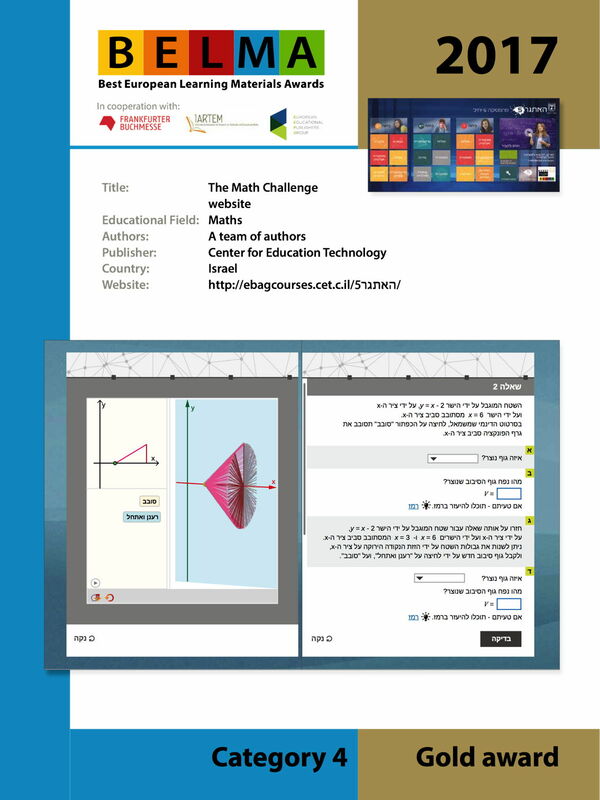 Interactive videos really help to understand mathematical problems. Beautifully designed and produced. LMS works beautifully, teacher and student have access to different sections. LMS is very easy to administer for teachers. Complicated mathematical problems made easy by engaging teachers. GeoGerbra lab helps with step to step explanations and lets students try out different solutions. Interactive questionnaire very attractive way to set homework. Students choose their own learning path or teacher gives instructions. 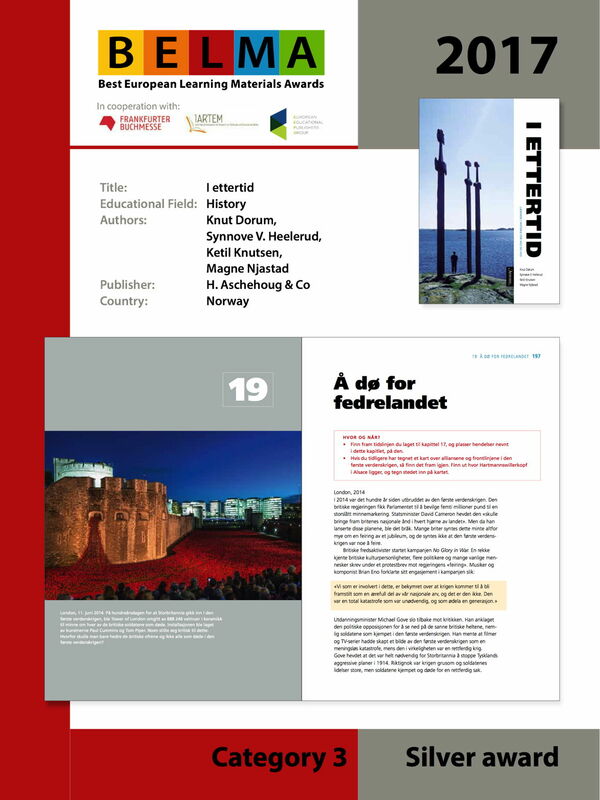 The material is relevant and user friendly for students with Danish as a second language as it both trains language skills and presents important knowledge about Danish society and culture. The topics are mostly taken from everyday situations and are therefore useful in the everyday life of the students. The chapters follow a clear didactic progression, which is generally accepted as fruitful in the work with L2; especially important and positive is the emphasis put on pre-reading. Before each chapter, a useful summary of the content is given so that the student is prepared for what follows. The texts represent different genres; this increases the variation of each chapter, and it also offers a good insight into many kinds of texts which the students encounter both in and outside school. The material deals through the available digital tools with listening, reading, writing and talking. Grammar is properly covered by video introductions; this is an original and creative feature in the material. The exercises are varied, engaging and connected to each topic or to the grammar in a relevant way. References to useful internet sites give the students the possibility to increase their knowledge of a topic. One chapter is of special interest: the last chapter introduces the ethnographic method of finding information on a topic chosen by the students; the work with this particular topic and the experience with the ethnographic method is an original and creative way of testing the students. The digital tools make it possible to save and share your work. Easy to read and user-friendly layout, enabling straightforward selections of material. Images guaranteed to catch the reader's eye. Pays attention to green issues. Employs various methods of presentation to achieve learning outcomes. Introduces concepts of gender roles and invites discussion. In addition to traditional important aspects of language teaching and learning, the application clearly succeeds in integrating various relevant issues in the course such as nature, family, living arrangements, parties, and social life. Each chapter is organized with the same structure (e.g. read - understand, listen - understand - language and grammar, discussion etc.). The multimedia aspects are taken into account by presenting interactive assignments, listening exercises, and video introductions to grammar. The final chapter on ethnographic methods inspires the students to analyze the interaction between people, culture and society. Publisher : Edizioni Centro Studi Erickson S.p.A.
Main characters are able to engage children's interests and are lovingly drawn in a comic style. Very solid methodological background (concentrating on specific spelling problems). Good progression from less to more complex activities. Introduction/explanation directly aimed at children, so self-learning is possible. Makes remedial work fun and can be used to boost slow learners' abilities through activities without causing anxiety. 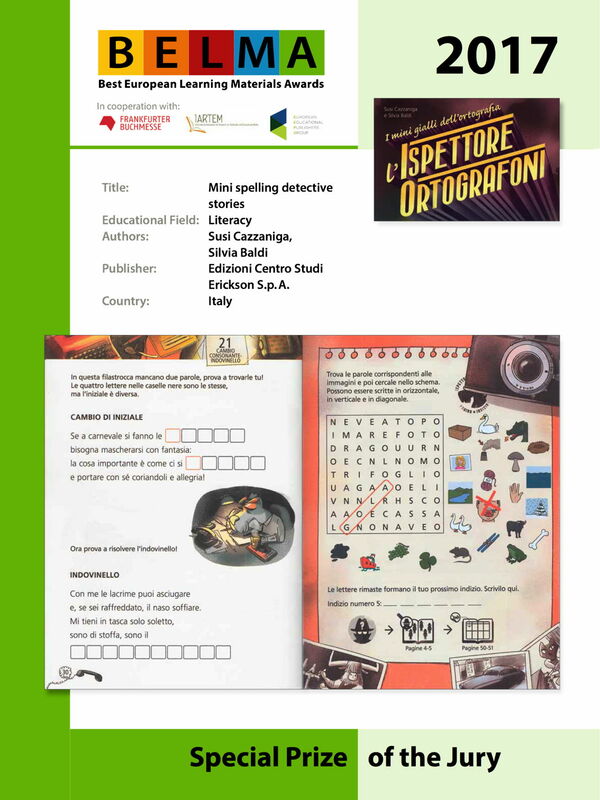 The concept of the material interestingly builds upon a mystery case game to motivate learners to practise Italian spelling and acquisition of vocabulary. The overall design and page layout of the five books is really straightforward and attractive. The illustrations are relevant and age-appropriate. The books are suitably introduced by a foreword which clearly provides clear guidelines for using the material and carrying out the different tasks and activities the learner has to undertake to investigate and find out which one of the characters is guilty. The material offers language practice through a wide variety of exercises and activities, i.e. riddles, puzzles and crosswords. The language knowledge and skills objectives are entertainingly implemented through activities dressed up and contextualised in game-like activities. Tackles a subject which children may find dull in an innovative and interesting way. Very clear and systematic design and presentation. The tasks, in the form of puzzles to be solved, will engage and motivate the readers. There is a progression from the simpler to the complex in the five books. There are also opportunities for engaging pupils with learning difficulties.